A challenging project to turn awkward closet space under the stoop of this brownstone into a tiny but impactful bathroom. 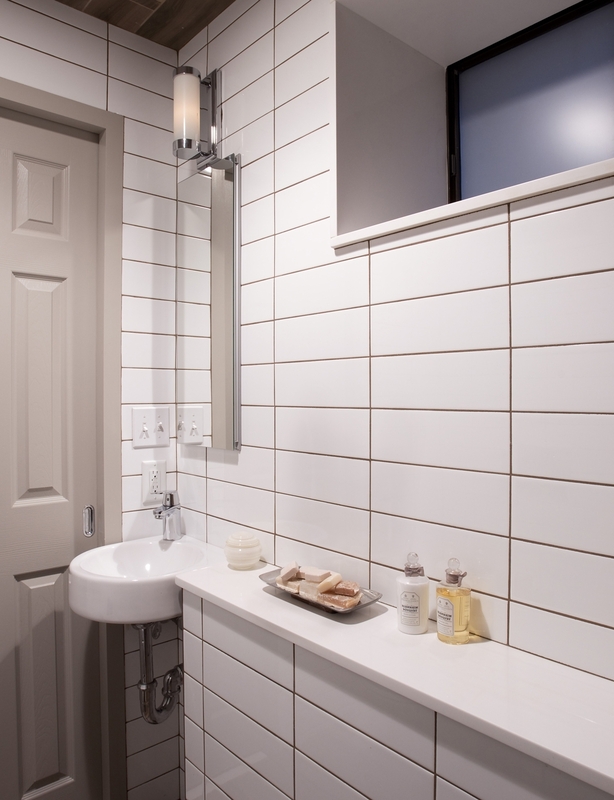 Clever design and engineering allowed the transformation of a small study into a full guest suite including the installation of this full bathroom. While waterproofing and insulating very carefully, Chelsea fought for every available “design” inch within the excavated space beneath the entry stairs of this home. Tiny tricks at work here; a walk in shower with a petit glass splash panel, tile walls and ceilings so that everything can get wet, a space-saving wall hung toilet, a window sill that doubles as storage, and a minimal sink. The result is a surprisingly spa-like feeling space below the sidewalk level of Marlborough street!